The Indian online retail sector is young and witnessing a huge growth. The industry is growing at the rate of 40 per cent annually and is likely to touch Rs 3,600-crore mark by the end of 2013. There are huge possibilities in e-retail space because of large population base, changing consumer lifestyle and lack of infrastructure for bigger bricks-and-mortar stores. 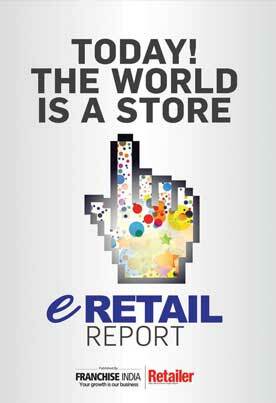 Currently, more than 400 e-retails are operating in the sphere and many more are ready to join the game. Certainly, e-retail is going to be a game-changer. Franchise India has come up with the exclusive market research report "eRetail Report" on the highest performing sectors of online retail. Through an extensive research and analysis, the report identifies the highest selling categories of the online retail. The top categories are apparel, accessories, CDIT, books and music, jewellery, footwear, beauty and wellness, home, and gifts and flowers are the top categories in the e-retail space. Among them, apparel is at the first position, followed by accessories and CDIT, enjoying market share of 17 per cent, 15 per cent and 13 per cent respectively. Through an elaborate survey of the 500 online shoppers across metro cities and tier I and II cities to bring to light the consumption pattern and key transition trends in the Indian online shopping industry. The report discloses that 24 per cent Indians are shopping online once a month, and 57 per cent are spending Rs 500 to Rs 2000 in one go. The survey also gives deep insights into where, what, when and why people shop online, frequency of shopping, their attitude towards online shopping. Overall, the report aims to incorporate trends of the industry, as well as brings forward a detailed study of the overall consumption pattern, category research, growth factors which are changing the landscape of the e-retail industry. Where, what & when do people shop Online?